FATAL ACCIDENT--Mr. Jacob Chapman, formerly of this town, in attempting to jump from a rapidly moving train at Worcester, Mass., on Sabbath evening, was thrown under the cars and so shockingly mangled that he lived but a short time. His remains were received by his brother in this place on Wednesday. 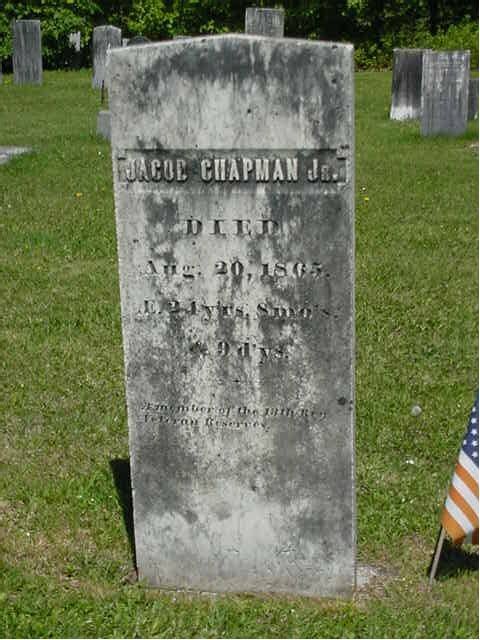 Mr. Chapman was formerly in the employ of Messrs. E. & T. Fairbanks and Co. On the outbreak of the Civil War he enlisted in the 3d Vt. regiment. He was afterwards discharged for disability, but at the time of his death he was a member of 13th regiment Veteran Reserve. He leaves a wife and one child to mourn his sudden death.